Dr. John R. Talburt is Professor of Information Science at the University of Arkansas at Little Rock (UALR) where he is the Coordinator for the Information Quality Graduate Program and the Executive Director of the UALR Center for Advanced Research in Entity Resolution and Information Quality (ERIQ). He is also the Chief Scientist for Black Oak Partners, LLC, an information quality solutions company. Prior to his appointment at UALR he was the leader for research and development and product innovation at Acxiom Corporation, a global leader in information management and customer data integration. 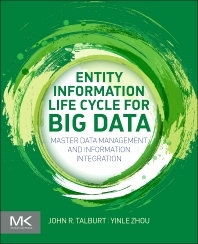 Professor Talburt holds several patents related to customer data integration and the author of numerous articles on information quality and entity resolution, and is the author of Entity Resolution and Information Quality (Morgan Kaufmann, 2011). He also holds the IAIDQ Information Quality Certified Professional (IQCP) credential.